Despite the location in the South Atlantic, blue skies and calm waters are not always guaranteed here either. 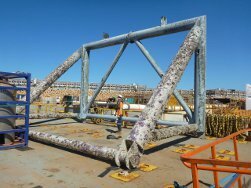 After successful completion of two finger piers for a major gas development at Barrow Island, off Perth, Australia, temporary works designed by R G Parkins & Partners Ltd have been dismantled and removed from the water complete with crustaceans after successfully combating hurricane seas over two years. The suspended structures allowed personnel access to construction decks over 15m above the water level.